Beautifully built, sounds gorgeous, and it’s more affordable than before – what’s not to love? Canton has a great record with soundbases, combining excellent sound quality with ease of use in one nicely built and affordable box. And it keeps getting better. The new Canton DM 55 replaces the much-praised DM 50, a five-star performer at £400/$600. The addition of a glass top, some sonic tweaks, and a price drop make this good-looking and capable unit even more appealing than before. Fire up the Blu-ray of Fast & Furious 7, and you’ll immediately hear the throaty rumble of roaring engines, the crisp crackle of windshields and glass smashing against the pavement and clear, warm voices. It’s a rich, meaty sound. Sound effects are spaced out nicely, with each explosion and ricocheting bullet having the right amount of solid punch and excitement to keep you drawn into the film’s crazy action sequences. Bass digs deep – very deep – but stops just short of overpowering all the other frequencies. It’s not all about the brawn, though. The DM 55 also manages to be agile and subtle amidst that full-bodied performance. As Vin Diesel, Dwayne Johnson and Jason Statham try to out do each other on who has the manliest voice, the DM 55 is talented enough to distinguish the various nuances and textures of each stony-faced growl. Even the few quieter moments are handled with a mature degree of control. The Canton’s talents translate neatly over to music, news and daytime TV too. As an upgrade to your TV’s sound, it adds a layer of depth, richness and atmosphere that really draws you into whatever content you’re watching. In terms of features and connectivity, the DM 55 scores highly. It’s easy to use thanks to the large LED display and well-designed remote control. Unlike the flimsy credit-card types we see a lot with rivals, Canton supplies a chunky and solid remote with clearly-labelled buttons that make it intuitive to use. Connections on the DM 55 remain the same as before: you get two digital inputs (optical and coaxial), a pair of RCA analogue inputs, and a subwoofer output. Bluetooth aptX lets you stream music from any smartphone or tablet. There’s still no sign of HDMI inputs, but we don’t feel that’s a huge miss as the optical input works perfectly well. While we wouldn’t mess with the bass and treble levels much (the Canton sounds well balanced as it is), it’s worth switching between the Surround and Stereo modes. Stereo keeps everything solid and tightly focused, while Surround opens up the soundfield without, crucially, affecting midrange fidelity too much. It’s a subtle difference, but worth trying if you want a bit more atmosphere when watching films. 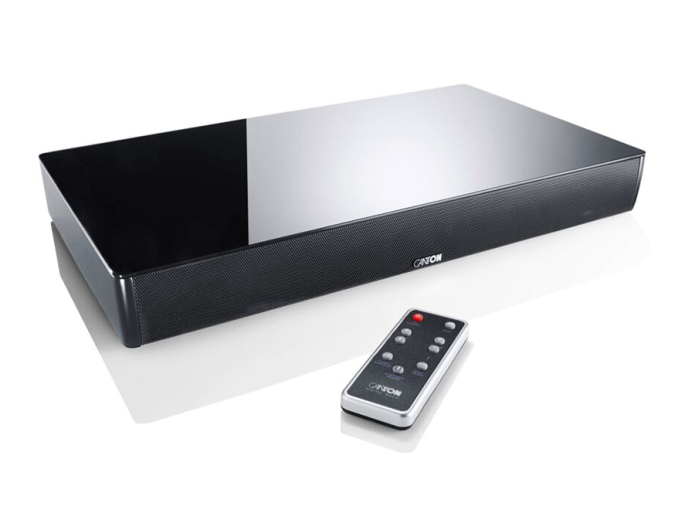 The Canton DM 55 remains an impeccably built soundbase. The structure is sturdy, and feels even classier than before thanks to that sleek glass top. 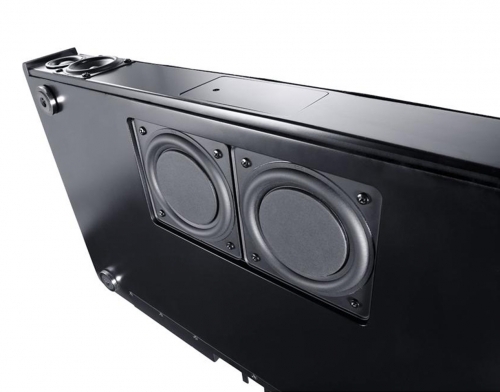 There are metal feet underneath that not only add to the DM 55’s air of class, but also add enough of a gap to allow the two downward-firing woofers underneath the base to work properly. 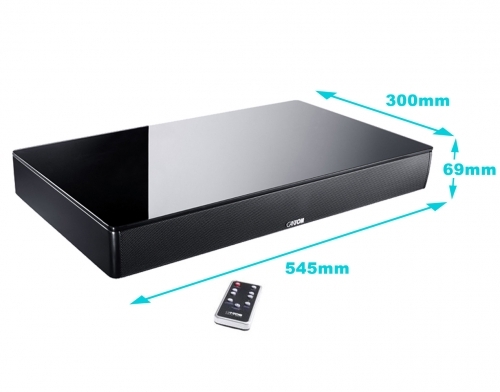 The DM 55 is a hefty thing, and can support TVs weighing up to 40kg. That should be fine for most flatscreen TVs, but we’d make sure your TV’s stand fits on top of the DM 55. If not, you can simply tuck the DM 55 on the rack underneath. 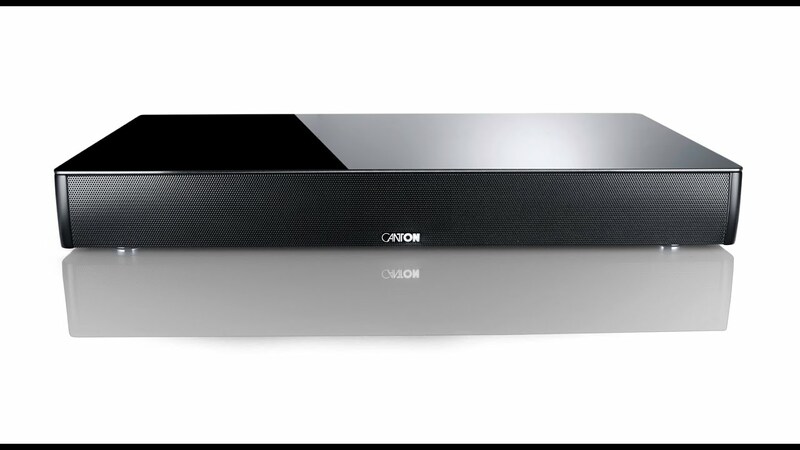 If you’re after a soundbase that both looks good and performs brilliantly, this Canton DM 55 is definitely one you need to audition. It’s lovely to use, it looks classier than its price tag would suggest, and the sound quality is the best of its kind. The drop in price from the older model (the DM 50 was £400/$600) also makes this an unexpected gem of a bargain. It’s an exciting, involving performer.